From the shooting of John Crawford III in a U.S. Wal-Mart store for holding a pellet gun, to the removal of black students from an Australian Apple store over fears they "might steal something," to France's recurring debates over "Islamic consumption practices," race plays a significant role in marketplaces. Race is also a key site of hierarchy upon which marketplaces rest, according to scholars. Enter the 'Race in the Marketplace Research Network,' - an emergent group of international scholars working at the intersection of race and markets. 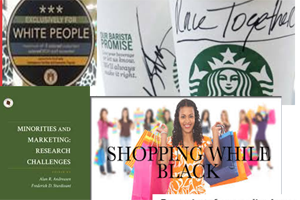 "In establishing the Race in the Marketplace Research Network, we aim to build a network of innovative scholars who will advance an understanding of race," said Sonya Grier, Kogod School of Business marketing professor who conducts interdisciplinary research on topics related to race in the marketplace. "Network scholars will share their insights with each other and key stakeholders to build more equitable markets worldwide." Why Race in the Marketplace? As the RIM network organizers have noted, some scholarship explores the essential role of race and racism in the conception and maturation of prominent present-day global markets. The banking, textiles and soft commodities markets are deeply rooted in racially charged colonial and imperialist practices. Racial dynamics remain central to contemporary marketplace operations across the globe, such as target marketing, advertising, (reverse) redlining, service delivery and consumer profiling. As race-related marketplace challenges repeatedly surface worldwide, scholars say there must be research on how existing racial hierarchies hinder inclusive and equitable marketplaces. Through RIM, scholars will build collaborations to examine how race impacts markets across diverse areas (commercial, health, art and other markets), how they can work together on research projects, and how to communicate cross-disciplinary findings. The network's first-ever forum, called the Race in the Marketplace Forum, was organized by Grier along with Professor Guillaume Johnson of the University of Paris-Dauphine, and Professor Kevin Thomas, University of Texas at Austin. The RIM Forum brought together more than 50 international scholars to Kogod School of Business for the two-day event. Using a contentious moment in marketing as a case study, Grier, Johnson and Thomas recently published "When the Burger Becomes Halal." In France, a popular fast-food chain introduced halal meat exclusively at several of its restaurants, leading to media coverage after a town's mayor decried the company's decision. Grier and her colleagues analyzed hundreds of comments on the issue in various media outlets. Echoing the French national motto -- "Liberty, Equality, Fraternity" -- they identified three key debates, namely liberty (can the fast-food restaurant impose halal? ); equality (is the strategy discriminatory against "non-Muslims"? ); and fraternity (do "Muslims" deserve such attention?). They show how privilege gets defended and challenged in the marketplace. Highlighting the power of such discourses is one area where RIM network scholars hope to make a difference and improve marketplace research. "Researchers and marketers alike are working to understand consumers in changing markets fragmented along racial, ethnic and religious dimensions around the world. These investigations must grapple with the realities of how history, social hierarchies, power and privilege inform and shape marketplaces and consumer experiences," the researchers write at the conclusion. "By expanding investigations of marketplace inclusion and exclusion to explicitly consider the role of privilege and associated power dynamics, researchers can contribute to the evolution of more equitable [marketplaces]."